In 2018, Music@Menlo inaugurated the Overture Concerts, in which the International Program artists collaborated with festival main-stage artists for the first time. 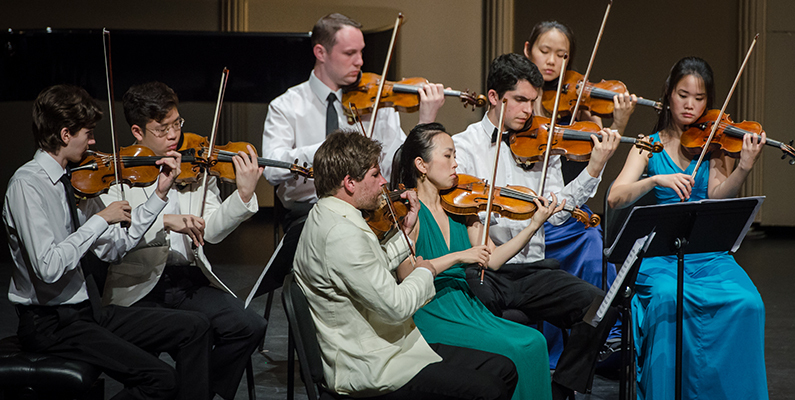 This season, all eleven spectacular International Program performers will be joined by violinist Soovin Kim, violist Richard O’Neill, and cellist Keith Robinson for a thrilling performance at the Center for Performing Arts at Menlo-Atherton. This concert functions as an “overture” to the future of chamber music: world-renowned festival artists will share their knowledge, experience, and traditions with the burgeoning International Program musicians as they perform together, bringing the freshest perspectives to these events. The artists will collectively bridge the gap between the traditions of the past, the master performers of today, and the flourishing of the art form in the future. Please join us to experience the fruits of their collaboration and to witness a glimpse of the bright future of chamber music. Tickets: $34. Young Patrons Society members receive two complimentary tickets, and Young Patrons Leadership Circle members receive four complimentary tickets to the Overture performance.